It's July 15 and you all know what that means~ It's Bloom Day and Garden Bloggers all over the known blogasphere are celebrating the blooms in their garden. You can see more gardens then you can imagine in one day if you stop by hostess extraordinaire Carol of May Dreams Gardens to take the Mr Linky magic carpet ride to adventure. Tonight is also the Full Thunder Moon, Buck Moon or Hay Moon. I am hoping that calling it Full Thunder Moon we will remind Mother Nature to give the Middle South regular popup thunder showers. In the meantime, I comfort myself knowing that I am getting a good upper body workout dragging the house to containers set in the full sun. Like the Verbena which is thriving in a container near the Susan's Bed. In the meantime, please enjoy the flowers~native and native friendly exotics~ that make me smile during this very hot, humid and popup showerless challenged garden. The Susans are beginning to bloom. Yeah for Rudbeckia fulgida and Rudbeckia hirta species. They join the cultivars in bringing happy smiles to this gardener. Now have a great day and a wonderful weekend. All so wonderful, Gail, and fabulous captures of the critters as well as the flowers! Thunder Moon sounds promising! My susans are starting to bloom too, and I love what you wrote, "Mr Linky magic carpet ride to adventure". Indeed it is. It will take you to so many lovely gardens. Sure hope you get some of those popup thundershowers Gail. It's pretty dry here too, and hot. I can definitely empathize! Your blooms and pollinators look happy in spite of the weather. I love 'Golden Jubilee's bright foliage, and how it so happily seeds itself around with babies retaining that fantastic foliage color. Agastaches are so tolerant of these dry conditions too. Lantana is so attractive to pollinators, and gardeners too! 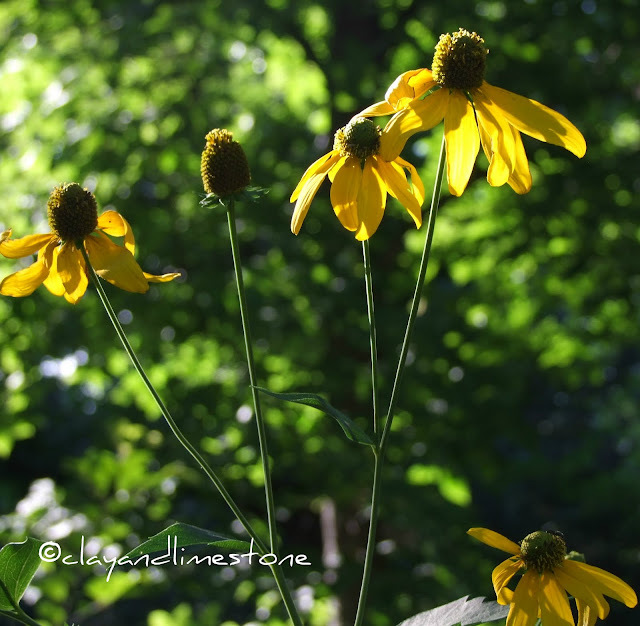 You get an A+ for composition, Gail:) The perfect intro and conclusion--the coneflowers make me smile, too, and as they fade, the rudbeckias take their place in keeping me happy. So many visitors to your garden must bring you joy as well. Happy Bloom Day! Looks as if the pollinators are celebrating with you this month Gail! Happy Bloom Day! Always a pleasure to visit Gail! Drum roll indeed, the Susans are blooming like crazy here in Austin too and they always make me smile!! Stunning photographs Gail. I love the Rudbekia, definitely deserves a drumroll. Happy GBBD. What great photography! I loved the photos of all the insect visitors to your garden. Your flowers are beautiful...who wouldn't want to visit! I love that I can always rely on you for some wonderful close-up shots of pollinators and other insects! But I also love that first shot of the Echinacea. Great photos Gail. I always like to see your beeeeez. Happy GBBD. 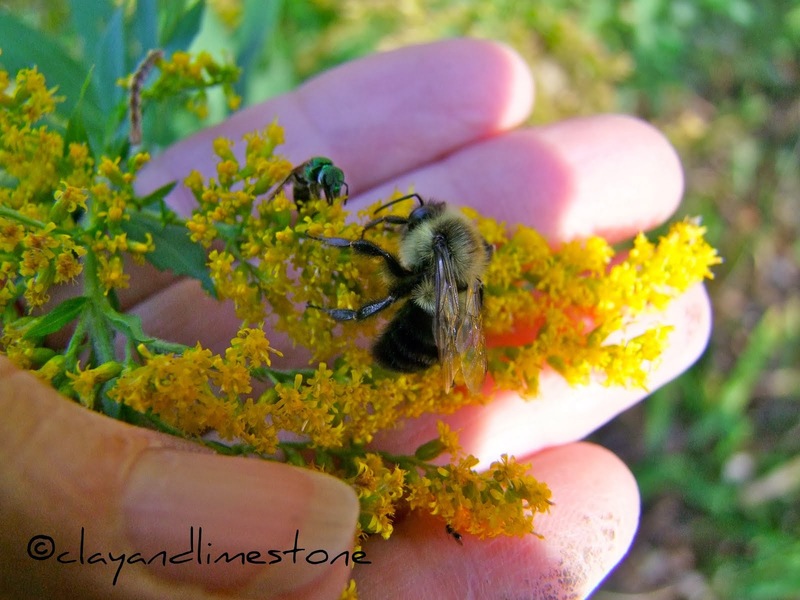 Blooms & pollinators go together. They are so pretty. Sure wish you had some of this liquid sunshine that we are getting. Doing it now. Critters, creatures and blooms! You capture your garden so well. I have to convince the bees that if I deadhead monarda before it gets too ratty, apply PlantTone and water, there's a good chance of more blooms. Still, they don't like to get off the blooms...even the cuttings in my trug! I hope you get those storm rains you are looking for. Lately that has been all we have been given, but I will take them wind and noise and all, as long as they keep the rain coming. Happy GBBD! Love the intimate looks at your fresh flowers and amazing array of insects, Gail - and please, please Mother Nature ... let us bothe have a Full Thunder Moon! Have you ever made tea from the Agastache? It is delicious iced. Ah, your photos are so cheerful and vivid. Those intense colors look good even in the harsh summer sun. And the butterflies certainly add a touch of magic! What a beautiful show of blooms and insects! 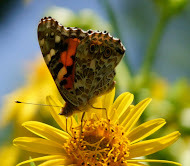 Butterflies are just something that gives a garden a very special additional touch, don't you think so? I want pop-up thunderstorms too. It has been raining all around us this week. Your flowers are beautiful! Really Pretty, Gail!!! :-) Hope you're enjoying your weekend as well. You know, bloom day was my birthday this month. But it was too stinking hot to see any blooms here. Every day it's 110-115 heat index with an 80 dewpoint. Anywho, may parents are also excited to see their rudbeckia blooming on their 2 acre prairie after a year or two away. I told them that's natural, but they didn't believe me. I can't get my 'Cherry Brandy' to last more than a year, can you? Great shots, Gail. Love the Callirhoe and that Supertunia is gorgeous. Happy birthday! Wow! I just love your flower collection. My favorite is the Verbena 'Princess Blush. Gail — your flowers are always gorgeous but no one is better at capturing them, and so often with delightful garden critters in the frame. A beautiful GBBD! What a beautiful set of flowers for GBBD. That photo of the tiger swallowtail took my breath away. I must find out if agastache grows down here in Houston. The sunflower family can get no better than in Clay & Limestone. Happy GBBD and Hay Moon. P.S. I'm trying out my first R.fulgida and I love it!